I never lived near my grandparents growing up so when we would make our annual trek to Michigan I so looked forward to seeing them. I have so many great memories from visiting. One thing I remember is that when I would spend the night at my grandma's she would always make me a big bowl of Coco Wheats for breakfast. It would be so creamy and chocolatey, but would also have these little lumps that I loved. Oh how I looked forward to that breakfast. 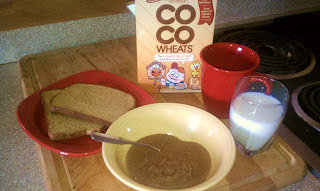 At our house in Maryland though, my mom never could really find Coco Wheats. We would sometimes bring a box back from Michigan and it was a great treat to enjoy at home, but before long the box inevitably was empty. I was thrilled when Dave and I moved to Delaware because lo and behold our local Food Lion had Coco Wheats! However, I guess I was the only one who was excited about this because before long they stopped carrying it. Skip forward to yesterday when I was walking through Wally World when what to my wandering eyes appeared...boxes of Coco Wheats! I may or may not have bought all that was on the shelf. and shared it on Facebook and Twitter. And why I'm now writing a whole post about a breakfast item! Doesn't everybody blog about their breakfast? Have you heard of Coco Wheats? Eaten them before? Thoughts??! !